in the very heart of Italy, there is a region named Umbria, nestled beetwen the most known Tuscany and Lazio, cradle of the Roman civilization. 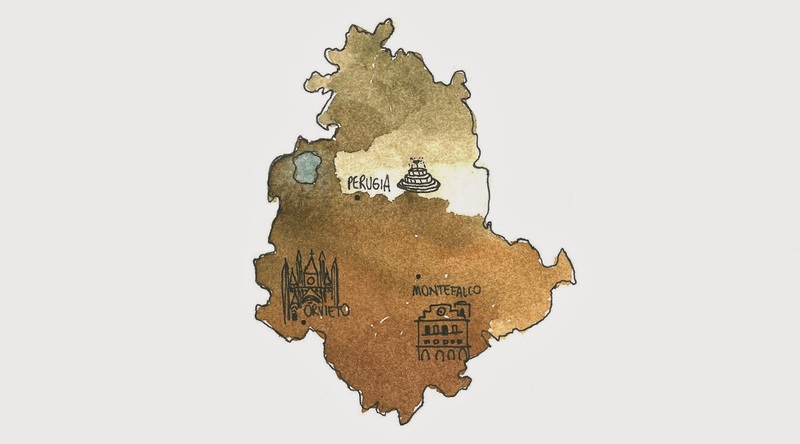 to me, Umbria means hills, rich traditions, stunning sacred art, medieval villages (on the top of the hills), tasty food in which local ingredients succeed in expressing themselves, preserving the peculiar flavours given them from a generous land. every time i have the chance to visit this region, i came home willing to go back soon, to see more, to taste more. this time was no exception. the three stops of this brief field trip were Perugia, Orvieto and Montefalco. the main colors were an intense, dark green, some warm browns and some touch of red. an evocative mist wrapped the foot of the hills, letting perched villages and pointy cypresses surface. the fog, far from being gloomy as it can be in other places, softly followed us, framing the landscapes full of vineyards and olive trees.